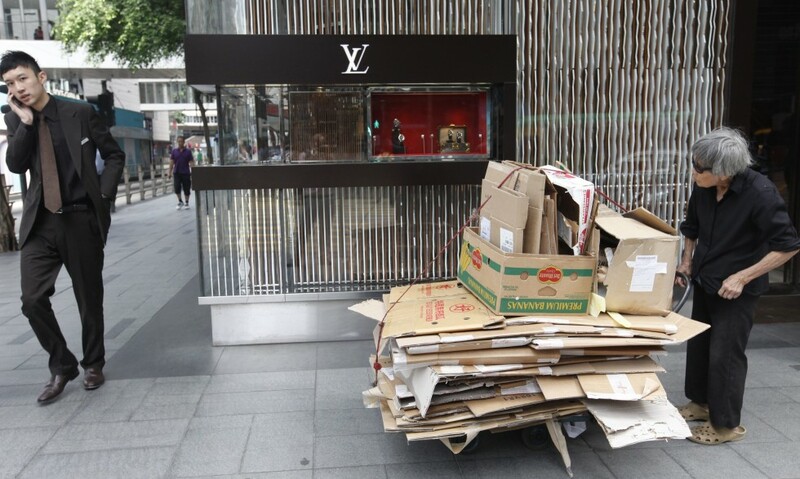 In 2012, research by Friends of the Earth (FoE) revealed that Hong Kong’s supermarket chains were throwing away tons of food everyday. FoE estimated that the big four supermarket chains: ParkNshop, Wellcome, China Resource and Jusco (now renamed Aeon) combined were sending 87 tonnes of food to the landfill each day. According to FoE, “In a year, the food they throw away is equivalent to the weight of two thousand double decker buses.” Of that amount, one third is bread, vegetables, fruits and even sushi that is still edible. Two thirds consists of peel and expired food which they classified as non-edible (However, as John Oliver explains in this hilarious segment, the expiration dates set are quite arbitrary and most food is still edible well past the expiration date). 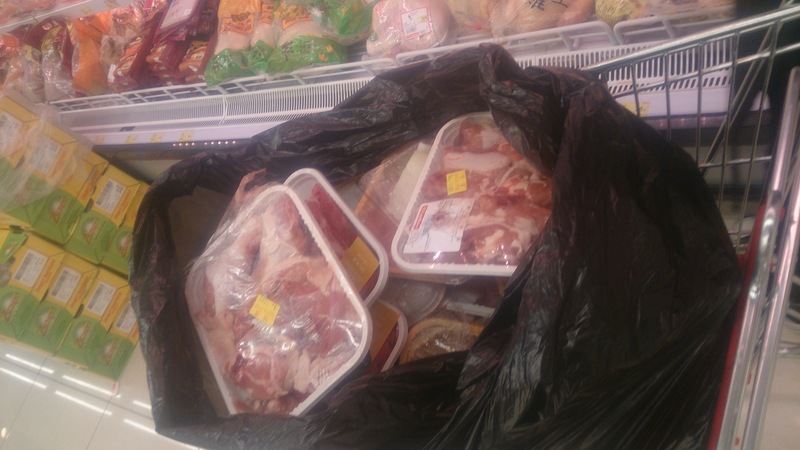 The meat in this photo is still edible (I don’t believe that supermarkets would remove it from the rack only after it is rotten), it should therefore be donated to chairty for distribution to low-income families or the substantial elderly population that is living in poverty. However, since there is no law requiring them to do so (in addition, to the fact that it is still free for supermarkets to dump waste into the landfill), the simplest and easiest solution is to continue to throw unsold, edible food into the landfill. To discourage dumpster diving, some supermarkets even adopt measures such as pouring bleach on discarded food. Hong Kong ranks no.1 in inequality: the gap between the rich and the poor is the largest among all developed countries. One third of the elderly population (65 or over) lives below the poverty line. That’s why we always see old folks with bent backs, pushing heavy metal carts to collect waste paper or discarded metal in order just to survive. No matter how much supermarkets reduce prices on this unsold food, these seniors will never be able to afford to buy it. GoGreenHongKong urges the supermarket chains to stop throwing away good food and instead donate it to charity for distribution to low-income families and the elderly.